And there it is! The blooming cactus!! OK, so maybe this isn’t really Kismet, but what do I know about birds? Kyla knows a lot more than I do. As you can see in this Friday’s Foto Fun. The cactus is blooming at her house and she’s ready for anything in her hard hat. Bloom away little cactus! And provide much beauty for my Kyla! It’s Friday! Time for some Foto Fun. I don’t think I’d like to live near any cactus. I’m afraid I’d get stuck. A lot. Where it would really hurt. HEY…..Don’t y’all forget about Jazzi’s Taco Day tomorrow. Kyla and I have a date. For golf and tacos. 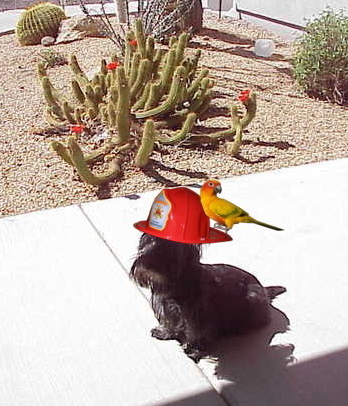 This entry was posted in The Scottie Chronicles and tagged animals, birds, blooming cactus, dogs, friendship, love, pets, The Scottie Chronicles. Bookmark the permalink. We don’t think we’d like cactus either. How would me and Andy not get our who-ha’s stuck on the needles? Of course Elsa would have no worries. Arrriba, Arrriba for tacos! I think Kyla is wearing the hard hat so Kismet does not go shadoobie, tootsie roll, take a dump, number two, on her head. Great photo how did you get it Kayla to sit still and the bird? I’m practicing my golf. You can imagine what happens here if you hit your ball into the rough. I abandon the ball-don’t want what you desribed. I’m sure that’s Kismet… probably parrots change their color in fall too :o) I agree with you, Kyla is a very wise Scottie Lady! Cactus is very dangerous. You can spend all day pulling out the thin stickers from your skin if you are not careful. Gloves do not help. Golf and tacos – sounds like a good date to me. A Golf and Taco date? I can’t wait to read all about it. Ouchies on the cactus…….and golf and taco sounds good to me – I like to chase little balls and if the taco has FISH in it I’m “in” ! !